Bright and cheery, bold yet comfortable, the sunflower is a warm and caring gift. With brilliant yellow petals that surround the flower’s centre, sunflowers have an unmistakable sun-like appearance that has made them a passionate flower choice for many. Sunflowers come in a number of varieties, ranging from small to large and from daylight yellows to sunset reds. the rest of the world began to appreciate its beauty and sustenance. Artists throughout history have appreciated the sunflower’s unique splendour, and those of the Impressionist era were especially fixated on the flower. Today, sunflowers continue to provide a resource for commonly used seeds and oil, but they have also become recognized as a floral symbol of great significance. 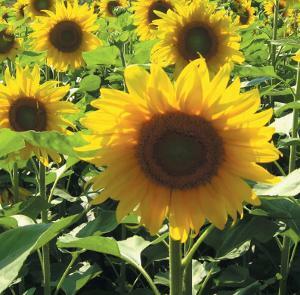 Much of the meaning of sunflowers stems from its namesake, the sun itself. Wild sunflowers are often photographed with their tall stalks and bright petals stretched towards the sun. This unique behaviour, known as phototropism, is a motif that has appeared in many ancient myths and is viewed as a symbol of loyalty and constancy. Their physical resemblance to the sun has also influenced their meanings. The sunflower’s petals have been likened to bright yellow rays of sunshine, which evoke feelings of warmth and happiness. In addition, the sunflower is often associated with adoration and longevity. For a flower, which reflects so many of the sun’s positive characteristics, it is little surprise that people enjoy basking in the sunflower’s warming glow. With the sense of brightness and warmth that sunflowers naturally impart, they have become an ideal choice for sending sentiments of cheerfulness and sunny thoughts.